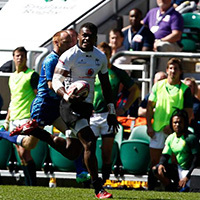 Official Website of Fiji Rugby Union » Vodafone Vanua Cup Challenge Officially Launched. Home > Newsroom > Vodafone Vanua Cup Challenge Officially Launched. The 2019 Vodafone Fiji Rugby Vanua Championship was launched in style at Al-bert Park in Suva Yesterday. The launch was conducted following a four hour rules and regulations workshop attended by over 100 representatives of the 16 participating Unions across Fiji. 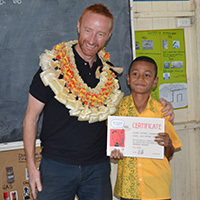 Fiji Rugby Union CEO, John O’Connor thanked Vodafone Fiji Limited for their continued loyal support of the Vodafone Fiji Rugby Vanua Championship and their commitment towards developing rugby at grass roots level. “I would like to thank Vodafone Fiji Limited for always being by Fiji Rugby’s side when it comes to supporting rugby in this country. This is very encouraging for all the teams playing in the tournament, as they play to represent their province with pride in this fantastic competition. Vodafone Fiji contribute over $300,000 towards the operations of the Vodafone Fiji Rugby Vanua Championship. A significant investment that includes man of match vouchers, plaing kit provisions, ball supply and a grant of $20,000 for Senior Divi-sion and $5,000 for the Under-19 category. Mr O’Connor said 2019 is another milestone year for the competition as it expands beyond the Senior man to include an Under-19s division and Women’s 10’s competition. 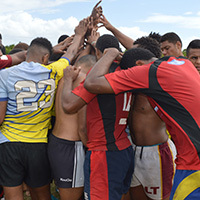 “The expansion of this competition provides another opportunity to strengthen the quality of rugby in Fiji through elite and highly competitive provincial competitions. Malolo and Navosa Rugby Unions join to Vodafone Fiji Rugby Vanua Champion-ship after being relegated from the Skipper Cup and are expected to add more fla-vour to the already fierce competition. Last years Vodafone Vanua Championship winners Northland and runner up Tailevu will feature in the Skipper Cup. O’Connor said whilst promotion into the Skipper Cup is the incentive for teams, this Championship provides a battleground week in and week for the players to enjoy the game the love and play their best rugby. There are two conferences in the Vodafone Fiji Rugby Vanua Championship com-prising of the Central /Northern division and Western division. The top two placed teams in each conference contest the Semi Finals and Finals. The Vodafone Fiji Rugby Vanua Championship will kick off on Saturday, 13th April, 2018 with the finals scheduled for 21st June this year.